1. Tell us a little bit about Rapa Nui (also known as Easter Island). 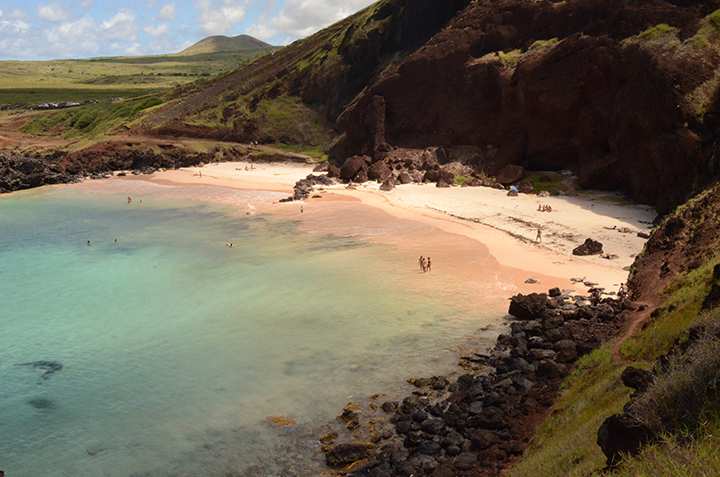 The Rapa Nui climate is subtropical. It is often windy, especially at volcano summits such as where Orongo is located. During summer which is from December to February (in the southern hemisphere), it is around 25°C during the day, and in winter, June to August, around 19°C. Rain falls year-round, though most of the wet days are between April and June. 2. How many people live here? Is the population growing or shrinking? The population is 5000-6000 people, depending on the season (more in the summer) and is growing. More than half are ethnically Rapa Nui. 3. What is abundant and what is scarce on Rapa Nui? Abundant: There is a lot to see and do here. Of course visit the infamous symbol of the island—the Moai (monolithic carved figures of the native ancestors). Activities like surfing, hiking, diving and horseback riding are also abundant. But, there are also too many cars for such a little island. Scarce: Rapa Nui has only one radio station and two television channels (one of them from Chile). We are hoping to keep it that way. 4. What is important to note about the island's geographical location or history? A thousand years ago, a small group of Polynesians paddled the world's greatest ocean in search of a new land. For generations, their ancestors had expanded eastwards in the vast Pacific Ocean, guided only by the stars. A new piece of land was found. The settlers of this tiny virgin island called their new home "Te Pito o te Henua", meaning "The Navel of the World". The name was seen fit as they were thinking that there can be no place more distant than this... and they were right. Generations passed, and the inhabitants of what was to be known as Rapa Nui built a civilization of art, capable of carving, raising and transporting hundreds of gigantic monolith statues, using nothing but their own hands and stone. A glyphic writing called roŋo-roŋo evolved. A culture had risen, full of achievements, intellect, music and legends—against all odds—in an environment where one would least expect it. Children were taught of their history and of who they are. Up until today, the Rapa Nui people remember their lineage back to the time when King Hotu Matu'a disembarked at the beach of Anakena lifetimes ago. 5. What are some of the practical challenges of living on Rapa Nui? You have to go to Chile, the main land, to buy things you cannot find on Rapa Nui and everything is expensive to ship here. All goods come by plane or ship so that's the bad part, but we learn to live with it. 6. Is there a stereotype about Rapa Nui you’d like to correct. Some people think that because the island is so little there is nothing to do here. Visitors plan to only stay for a day or two but they quickly discover that there was not enough time to see and do all they wanted to do. Another stereotype is that we all still wear aboriginal clothing, but really the island is a modern, beatifull place and the people are well-educated. 7. What do you think makes island communities, like yours, unique? We have a strong culture of music and dance. Our language is also quite unique I think (we are still solving the mystery of the roŋo-roŋo writing system). Our people have the urge to travel the world, but we always come back to Rapa Nui. 8. How are tourists generally seen by locals? People on the island like tourists and treat them very well. We learned to live with them and make them feel welcome, as our economy depends a lot on tourism today. 9. What is the best way to get there? The only way to travel to Rapa Nui for the common traveller is by air. Airline travel traffic is exclusive to Latin Americas largest airline —LAN. They usually offer one flight per day. There are two flight connections to Rapa Nui:Papeete (Tahiti); Santiago (Chile). From 2010 to 2013 there was also a flight connection to Lima (Peru), but this didn't end up being lucrative in the end, so the route was cancelled. 10. What should visitors know (or read) before setting out for Rapa Nui. Start with the book Kon-Tiki written by Thor Heyerdahl in 1948. He was a Norwegian explorer who sailed to Rapa Nui on a balsa tree raft. Heyerdahl maintained that people from South America could have settled Polynesia, although most anthropologists dispute this theory. His aim in mounting the Kon-Tiki expedition was to show, by using only the materials and technologies available in Pre-Columbian times, that there were no technical reasons to preventthe voyage. And tell us a little bit about you, Makohe. I have lived my whole life in Rapa Nui, but I travel a lot. At the moment, I'm in Sweden for example (visiting my husband's family), but I am going back to the island in two weeks. I miss it already. I recently had a baby boy named Nils Kainga. He is wonderful and loves music and the water. Right now I'm just in charge of him full-time, but on the island I sing and make my own music. My husband and I run a travel site, leading tours on the island and helping with accommodations. I also teach surfing to the children of the island and tourists alike. In 2008 I was part of the adventure documentary 180 South.